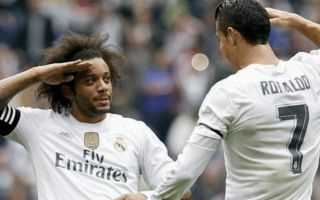 Having been a fundamental part of Real Madrid’s recent success, the partnership between Cristiano Ronaldo and Marcelo is no more after the former’s move to Juventus. The combination of the two down Madrid’s left flank was often key in breaking opposition sides down, with the pair striking up a great understanding and making sacrifices for each other. However, as per the official statement from Juventus, Ronaldo has made the move to Turin in a deal worth in excess of €100m, leaving Marcelo to now contemplate life without his long-time teammate at the Bernabeu. It remains to be seen how Madrid replace the Portuguese superstar and if the Brazilian international can link up with his replacement as effectively, but after the move was made official earlier this week, Marcelo has bid his own emotional farewell to his former teammate. “I learned a lot from you, your dedication is the most bizarre thing I’ve seen in an athlete,” he wrote in his caption on Instagram, as seen below. “I’m proud to have played with you, not because you are the best player but because of who you are. It’s a major loss for Real Madrid, and along with the departure of former coach Zinedine Zidane, it promises to be an important summer as Julen Lopetegui will now be tasked with ensuring that they don’t drop off moving forward. Replacing the goals, influence, leadership and quality of Ronaldo is arguably an impossible task given what he’s contributed over the last nine years, and that sentiment is certainly felt in Marcelo’s message. Quem diria hein Cris!!! É mano chegou a hora de dizer até logo… Te juro q nao imaginava que esse dia chegaria! Mas nada nessa vida é pra sempre, espero q vc seja muito feliz na sua nova caminhada. Foram quase 10 anos do teu lado, 10 anos de alegria, bom futebol, vitorias, derrotas e momentos maravilhosos! Aprendi muito com vc, sua dedicação é a coisa mais bizarra q eu vi em um atleta. Tudo de bom pra vc e sua linda familia! Vou sentir saudades das nossas resenhas antes dos jogos quando vc acertava o resultados e antes das finais nos tranquilizava com tua experiência e o carinho com os mais jovens! Tenho orgulho de ter jogado contigo nao por que VOCE SEJA O MAIOR JOGADOR DA P#RR% TODA e sim pela pessoa q você é!!! quando eu parar de jogar vou sentar no bar tomar uma cerveja e vou contar vaaarias historias e mostrar todas as nossas fotos ? Ja ja tamo junto de novo ??? #M12 ? ?